An MRI of Larry Fitzgerald’s right knee revealed just a sprain of the MCL (which is better than an ACL sprain). That’s good news. Fitzgerald said he’s talked to coach Ken Whisenhunt and the Cards will play it conservatively, which probably means no more preseason. 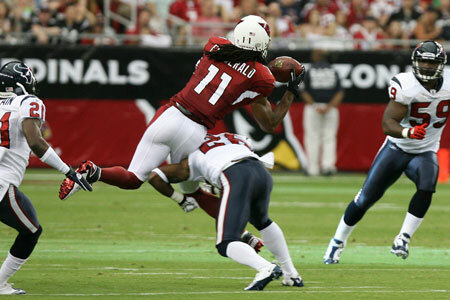 But Fitz is expected to be ready by the time the Cardinals open the regular season in St. Louis Sept. 12. Base on how it looks frozen in time (below) it could have been worse. Fitzgerald has to be happy. Hopefully, he’ll heal quickly; Steve Breaston suffered a similar knee injury in the first preseason game last year and it seemed to take him a little while to get going again. Any word on a possible fine for the Texans player. You can tell by the picture his was leading with his head. That picture is brutal. 😦 Hope your recovery is a speedy one, Larry. How can there be a penalty when he hit Fitz below the waist? Yes if it was helmet to helmet, but linebackers always lead with their head. Hope Brandon Keith can overcome last night’s effort. Matt will have a long season if the tackle on his blind side is getting mowed over a lot. Not sure if Reggie Wells could play tackle or not, he is pretty athletic for a lineman. That would enable Deuce Lutui to be reinserted into the starting lineup. It’s probably too late for a change like this but it’s something to think about. I hope to god he is okay…he goes down it’s gonn be a long season. It seems like the Cards WR’s are always hurt or banged up. Just bad luck. The only one who isn’t hurt is usually Fitzgerald. How many times have Boldin, Breaston, Doucet been banged up over the last couple of years. Hope it’s not Fitzgerald’s turn this year. That’s why, in my opinion, it was a huge gamble to let go of Boldin. Not a ton of depth and they are all injury prone. If you were Fitz, who would you be a more disappointed in, the coaching staff for running him on that route in preseason, or Leinart for throwing that ball? I know he’s probably not angry at anyone, being that he’s Fitz and all, but I’m curious who should shoulder some blame. Why does there have to be blame? I believe it’s crazy for players to skip preseason games altogether. He was going to play a series or two. He happened to get hurt. It happens. Thank heaven for small mercies. Thanks for the update. And, whew. I saw the play, but didn’t catch the close up shot. Dylan is correct, un-planted feet made all the difference. It is football. Yes it happens. It just seems to me everyone is piling blame onto Leinart for even throwing the ball. To me it seemed like the play calling would be equally responsible for such a thing during a game that means next to nothing for solidified starters. Blame was a bad word to use I suppopse. Just wanted your opinion. CZarr, It was a simple in route. It has nothing to do with preseason or not, this is football. If you are afraid of injuring a guy for making him catch a pass over the middle, what does that say about him? Guys get hurt all the time, with or without going over the middle. As far as “play calling” there were 3 other guys in the pattern to throw to, where the ball goes should depend on the coverage. recover well Fitz and get payback in the real games. awfully glad larry eleven is ok but he does play with no fear and, as a result, puts himself in harm’s way a lot. we should expect him to get dinged up once in awhile. i don’t think we should shut him down completely though. he and lineart and anderson need to play together. i also agree with the earlier comment that we could use boldin this year, especially if roberts continues to not make plays. good thing we got lucky with williams. What do you mean no penalty? Ever heard of a defenless reciever? He droped his head and went low. Pass was shoulder level. Fitz didn’t really need to jump but he did. If the Texans player was looking up he would of hit Fitz in the ribs and probably broken the pass up. Poor tackle. It was a good pass that had some decent zip on it, not the high floater that people criticize Leinart for. The only thing he did wrong was staring down Larry, and then the defender dove at Larry’s knee when he went up to get it. Warner would have made the same pass because Larry was open. Jcaswellsr, Yes there was NO PENALTY. There has NEVER been a penalty called for hitting e “defenseless” receiver when you hit the guy WHO IS COMING AT YOU, in the thigh. I guess you also think Adrian Wilson should not only be penalized, but suspended, and criminally prosecuted for the hits he puts on guys? Come on, this is football. It was a clean hit. darren did you make an interwiew with washington and skelton after the match? All you need to do is read the couple stories on the site. Mastt better put his ball on a rope. hit those pockets in stride. or we will see this again and again. Didn’t that throw come on a rope in stride? The defender was just in the right place. He told Kent Somers it was a misunderstanding. Taking the optimistic view – shouldn’t this give our logjam of talented receivers the opportunity to step up and show everyone what they can do? I don’t think Fitz was going to play a lot in the preseason one way or the other. Leinart’s tendency to throw high and over the middle is legendary. Last season he did a similar number on Q (throwing high over the middle) and had a similar result. If Leinart doesn’t clean it up, I predict that this will be the first of many WR leg injuries this year. At least when Anderson throws a ball, it’s nowhere near a receiver. I have had my doubts about Leinart…so much so that my wife is on my case about not being a loyal enough Cardinals fan. But Leinart was “EXACTLY WHO I THOUGHT HE WAS” he was statistically very accurate but his numbers are definitely anything to write home about. This was a very scaled back “gameplan” similar to the one he was forced to use against Tennessee last year. All he was asked to do was manage the game and not screw up. And he did that pretty well. 6 of 7 for 49 yards and 0 interceptions. Which says something considering his pass protection last night. However he did make 1 big mistake that almost cost us our #1 receiver, he stared him down. Even if you know you are going to go to fitz you still need to look off the safety. He was staring fitz down the whole time after he turned out of that play action fake and the safety saw it and went where Leinart’s eyes were. I bet he will learn from that and hopefully we wont see another picture like is shown above. Still very optimistic about the 2010 Cardinals! PS. I am voting for extra playing time for Daryl Washington. He was a stud last night. And I want to see what he can do against some of the 1st stringers. Is a brace standard for a strained MCL? I guess if he is playing Horse with Kurt it can’t be too bad. Great Point (and btw, I stole the thought for Twitter). Thats Football!!!!!! Wish we should have kept the best receiver in football BOLDEN!!!!!!!!! Leading with the helmet is illegal, and should have been a penalty. Does not matter if the hit was high or low, if the helmet is the first thing that makes contact, it is illegal. Not called as much in the NFL, usually only against the QB. High school it is a point of emphasis to call it to avoid neck injury. The penalty is actually meant to protect the defensive player more than the offensive player. Wasn’t leading with his head. His pads are against Fitz hip and his head is in front just the way ot should be. What do you want him to do, lead with his hips? I saw that play. It seem pretty obvious to me that the dude was tryin’ to put the hurt on Fitz. I think it was a cheap shot. Had the guy simply flattened him, I’d have said “That’s what happens when you run across the middle.”, but he went low, knowing Fitz was going up for the ball. You know, I’m not really trying to question Boldin’s personal preparation or physical training, but honestly, it seems to me that alot of his injuries could have been prevented through much better physical training/preparation (ie., frequent hamstring issues). Remember Fitz’s knee injury last year? His trainers and doc’s all said his knee should’ve been completely dislocated and he shouldn’t be back playing. But the muscles and tendons were in top notch shape, they actually helped prevent any real injury. In fact, if I remember right, Fitz was right back out there the next game. Although I doubt very many players would have been able to bounce back like Fitz, it just goes to show how important physical training really can be. And on a side note, I don’t blame Matt for Fitz’s injury. I think the pass was fine. Although, if Fitz does happen to appear in another preseason game, I have serious doubts Whiz will be sending him across the middle like that again. And to any other blogger out there who I normally see post these negative blogs. We have a great coaching staff, and a lot of depth even if they are young. This team is here to stay even if we loose one player. I would never dicredit any of the players that we have. Obviously we have some elite guys out there on the field. But unlike some teams, we are a team and we don’t rely on one magical person to carry us. Hey please tell me that Darryl Washington and Dan Williams will start the next game. Darryl had 13 tackles and a fumble recovery, Monty Beisel makes a good backup but not the best starter. Big Dan Williams was anchoring the line I loved that. One more note, did anyone see how good Max Komar was, I am so impressed with his play. You got to give a lot of credit to John Lott right? How many more years do we have him? John just signed a contract extension this past offseason, although I do not know how many years it lasts. John Lott is the best in his business. Never let him go to any other team… also WHIZ the greatest coach in the NFL. PERIOD!!!!!!!!!!!!!!!!! Just so you know, the best receiver in football’s name is spelled BOLDIN. A little respect for Q, please. Whatever. If you think my blogs are negative, then I don’t know what you’re reading. I live and die with this team, just like you do. I’m as “real” as you are. I’m really sick of people who can’t appreciate another person’s point of view if it is different than theirs’ OR – God forbid – isn’t rah, rah, rah all the time. I love this coaching staff, and I think they are the best staff this organization has had in my 35-plus years as a fan. Have your view and let me have mine. I don’t see where there is anything wrong with having an objective point of view that isn’t afraid to have questions or concerns. “Real” fans should be able to do that AND not have a problem when others do it as well. Thanks Scott, for correcting me.